I have been absent from creating for a while now. At first I used running as my excuse…all of my “free time” goes towards marathon training, and I don’t stay up late enough to create because I’ve been up early to run or exercise. But I realized that this was inaccurate. Because I stopped exercising in the mornings, and I haven’t been motivated enough to run in the dark, so I’m wasting the time I wake up early before work. Then I used guilt as an excuse. I “should” be cleaning up the house and purging in the basement. Which is totally true, but that never stopped me before from finding at least an hour a week to get my art on. And then I realized…I haven’t been creating because my creative space is not usable. I no longer had a space. We had some water in our basement mid February, before a trip, and many items got moved into the middle of the room rather than staying at the perimeter. It was messy before, I will admit, but it had reached a new level that not even I could live with. The image on the bottom shows the state of what was once my art space. Piles upon piles of paper, canvas, boards, and journals cluttered the room, along with other items that had no home, or needed to be sorted out. It had become a dumping ground. 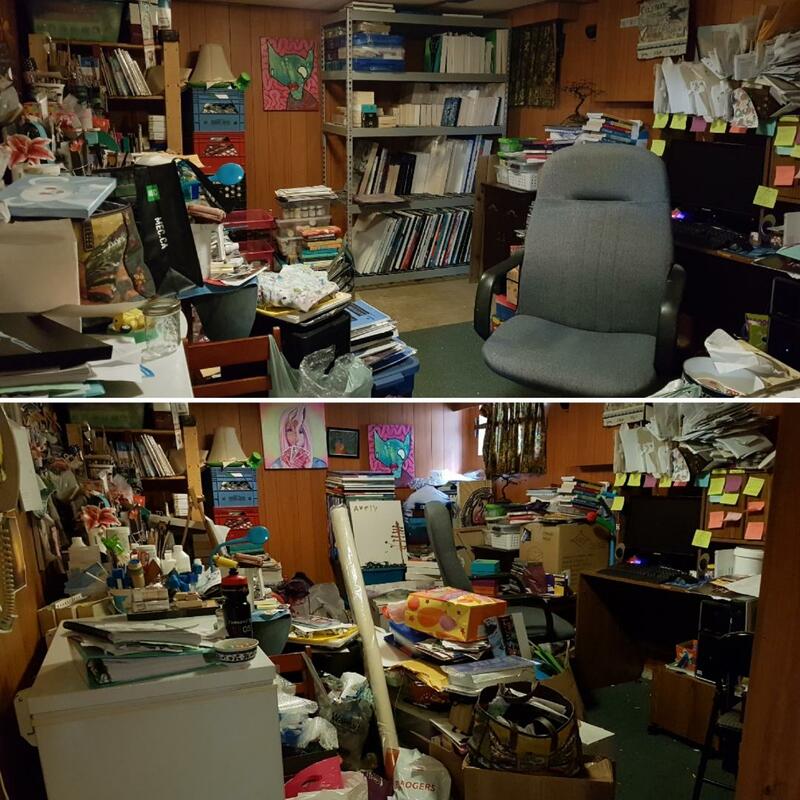 It made me sad to be in this space, and it made my head spin every time I tried to tidy it up…where does a person start in this place? I had called a company to help me purge and organize, and just for the basement they quoted $3000…6 people for 2 days going through my stuff. And I had to be willing to say goodbye to things. Which I am…to a point. NOT my art supplies. And they didn’t like that idea about as much as I didn’t like their price. So it’s up to me. I got serious and started a week or two ago. The image on the top is pretty close to how it looks today. I have done a little more, but it doesn’t look much different. The best thing I did was get a shelf to stack my canvases and boards, both completed, in progress, and blank. Seriously…best money spent. Even though I had to give in and ask my husband to help because it kept falling apart on me. lol. Yep, I’m that kind of girl. I also found that this time, I was able to say goodbye to most of my post secondary school notes. Yes, I graduated from College 14 years ago, and University 17 years ago, and I STILL had textbooks and hand written notes. I couldn’t bare the thought of all that money and work getting thrown away. And you never know…maybe I will want to look something up! Well…I have come to learn that if I want to look something up, I am going to Google…NOT my notes or old outdated textbooks. They are no use to anyone. And as Marie Kondo states in her book “The Life-changing magic of tidying up”, it has served it’s purpose. So out go two milk crates worth of paper in binders and two shelves worth of text books. Perfect! Yes…I did keep some notes that I spent A LOT of time on, and admire still. More sentimentally. But 1 binder isn’t so bad, is it? It is interesting to me what I am drawn to keeping. What is it about these items? Sometimes it is sentimental value. Looking at them or touching them bring memories back, that I never think about without prompting. I’m not ready to let these memories go. Sometimes it’s because it was a gift from someone…I had a book I was given from a previous employer that I didn’t even enjoy working for. That is now gone to a new home. Sometimes, as with the text books, it is the money spent on the items…or the thought that they could be used again. But if they’ve served their purpose, the money spent has already been redeemed in it’s use. And sometimes, as with the notes, it’s the time and care I put into creating it. …or someone else put into creating, like how I can’t part with the kids art pictures because they were so proud of their effort when they gave it to me. I am learning how to make space, and make peace with letting things go. I am learning to get over the guilt of not using something or spending money…of being wasteful. I am learning to find comfort in knowing that the things I am no longer in love with can bring someone else joy. And I am reclaiming my space! It’s a work in progress. Do you find it hard to purge? Or energizing and refreshing? Any tips or tricks to organizing your creative space? Stay tuned…the creating has begun! I will be more active in this space once again! Next Next post: New Colours!!! YOU CAN DO THIS! It is an overwhelming task. Set a specific amount of time, say 30 minutes, to work each day that you can. I will be checking in from time to time checking on your progress. Best of luck!